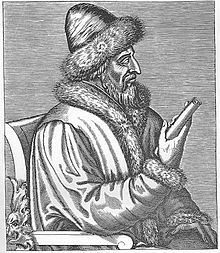 Vasili III Ivanovich, an engravin bi a contemporary European airtist. Vasili III Ivanovich (Roushie: Василий III Иванович, an aa Basil) (25 Mairch 1479 – 3 December 1533, Moscow) wis the Grand Prince o Moscow frae 1505 tae 1533. He wis the son o Ivan III Vasiliyevich an Sophia Paleologue an wis christened wi the name Gavriil (Гавриил). This page wis last eeditit on 4 November 2015, at 18:18.